Nigel Stephen Coates was born on 8 March 1959 and entered the Royal Australian Naval College in 1975, graduating from initial training with the Queen's Gold Medal as the dux of his graduating year. He then undertook bridge watch-keeping training in various ships, culminating in the award of the RAN College Jubilee Sword as dux of seamen officers training. After a period as Aide-de-camp to His Excellency the Governor-General of Australia, he trained as an air intercept controller and subsequently as a principal warfare officer. He served in HMA Ships Hobart, Adelaide and Brisbane before joining Maritime Headquarters. He received a Maritime Commander's commendation for his contribution to preparing ships for the 1991 Gulf War. As the executive officer of HMAS Darwin he saw service in the Red Sea before promotion to commander in 1993. He served as the senior military instructor, and subsequently Commanding Officer, of the Corps of Officer Cadets at the Australian Defence Force Academy, Canberra, receiving a Chief of the Defence Force commendation for his work there. 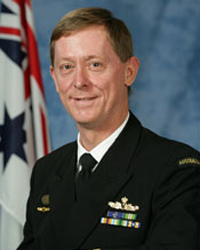 In 1996 Commander Coates assumed command of HMAS Canberra, winning the Duke of Gloucester Cup in 1997 as the most efficient ship in the Royal Australian Navy. Commander Coates then spent 18 months as Commander Sea Training at Maritime Headquarters, followed by another 18 months at the US Naval War College and Salve Regina University, graduating with a MA (International Relations). Assuming command of HMAS Anzac in 2001, Captain Coates took the ship on operational deployment to the Arabian Gulf. The ship was awarded the Duke of Gloucester Cup as the most efficient ship in the RAN for 2001, and Captain Coates was appointed a Member of the Order of Australia (AM) for his service in Anzac. Captain Coates was appointed as the Chief of Staff to the Chief of the Defence Force in mid-2002. He was promoted commodore and appointed as Chief of Staff, Headquarters Australian Theatre in December 2003, and subsequently became the Director General Navy Personnel and Training in August 2005. Commodore Coates was promoted rear admiral and served as the Fleet Commander from July 2007 until October 2009. Rear Admiral Nigel Coates passed away on 2 June 2010.